As the fundraising arm of the Catholic Archdiocese of Singapore, the Catholic Foundation has launched the Giving in Faith & Thankfulness (GIFT) campaign to urge every Catholic to participate in making the vision of the archdiocese a reality. 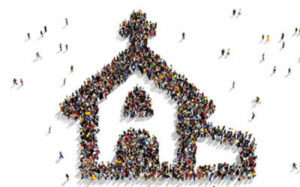 Our archdiocese dreams of becoming a more vibrant, evangelistic and missionary Church. Everyone is a unique child of God, blessed by God to be a blessing in return to those around us. By uniting in support today, this dream can become a real expression of God’s love through us. Catholic organisations will be able to constantly improve and increase their efforts to strengthen and care for families, and build communities. The Church will have more resources to reach out to young people, drawing more to discover Christ, and forming them to be a God-centred generation of leaders for the Church and nation. Further formation materials and programmes can be created to help Catholics of all ages deepen their understanding of the faith, alongside more initiatives to ignite an enthusiasm for God. Migrants who have left home to work in Singapore will find a community and increased support through the Church, particularly those who are poor or in vulnerable situations. The ageing shepherds of the archdiocese will find rest, comfort and care in a specially built residence when they retire. The future shepherds of the Church will have better training and formation facilities in a new seminary, where the laity can also study alongside seminarians. All Catholics in Singapore will have a better space we can gather to worship and serve God together, in a hub for our archdiocese’s activities. The future of our Church will be better secured for generations to come, through the creation of sinking funds in preparation for the renewal of land leases for a number of archdiocesan properties. Together, Catholics can make these and many more plans in the archdiocese happen. The Catholic Church works tirelessly for its spiritual mission to “unite all things in Him” (CCC 772). But to do this, the Church requires physical resources to live and work on earth. The Church is one body made of many parts. Thus, the funding for various needs of the archdiocese is split into different pools of funds, each managed separately. 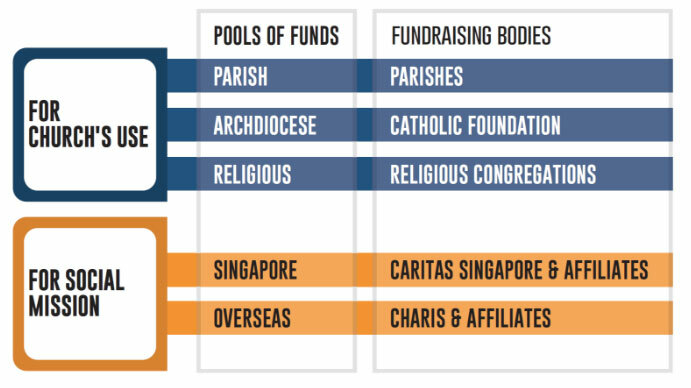 Donations to Catholic charities (Caritas Singapore, CHARIS and their affiliates) and to the religious congregations, for instance, are collected and used solely for their particular purposes, and do not go towards funding other organisations in the archdiocese or the parishes. Traditionally, the 32 parishes and numerous archdiocesan organisations (apart from charities and affiliates of Caritas and CHARIS) are funded by weekly offertories and other collections made during Masses. Each parish would contribute a fixed 15% share of its collections to the archdiocese, the rest of which were kept for the parish’s own needs. Beginning 2016, the 15% fixed contribution was revised to a tiered system of between 4% and 28% depending on the income of each parish. However, even with the revised rates, this contribution cannot meet the expanding needs of the archdiocese. Thus, GIFT supplements a funding model that has become insufficient for the Church in recent years. Resources are needed for the many offices, commissions, councils and other organisations in the archdiocese to continue their work in key areas including education, migrants, evangelisation, families and youth. They work as many parts of one body, seeking to bring the light of Christ to every aspect of society. Notable organisations include the Archdiocesan Commission for Catholic Schools (ACCS), Archdiocesan Commission for the Family (ACF), Office for the New Evangelisation (ONE), Office for Young People (OYP), and more. 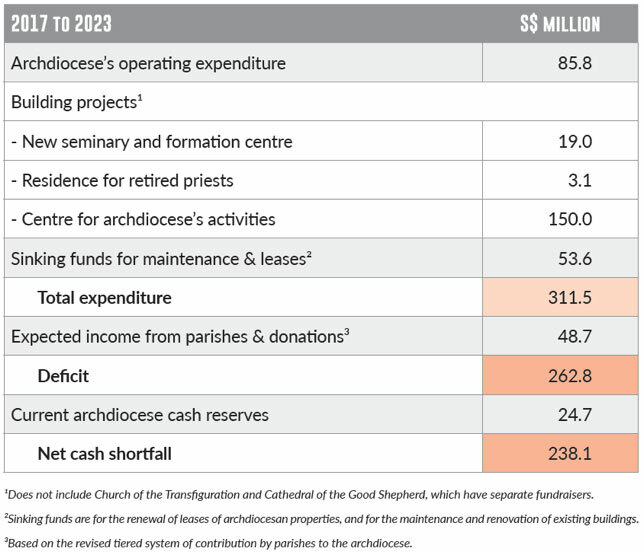 On top of current operational costs, the archdiocese has several infrastructural projects, building maintenance and land lease renewals, each of which runs into the millions. Near term building projects include a residence for retired priests, a new seminary and formation centre, and an archdiocesan centre. In addition, sinking funds, which do not currently exist for almost all of the Church’s properties, are being set up. Let us pray for a constant spiritual rejuvenation of our Church. Let us actively use our God given talents to love others today. Let us consider pledging a monthly contribution to our archdiocese, so that our Church may always have what is necessary to spread God’s love.